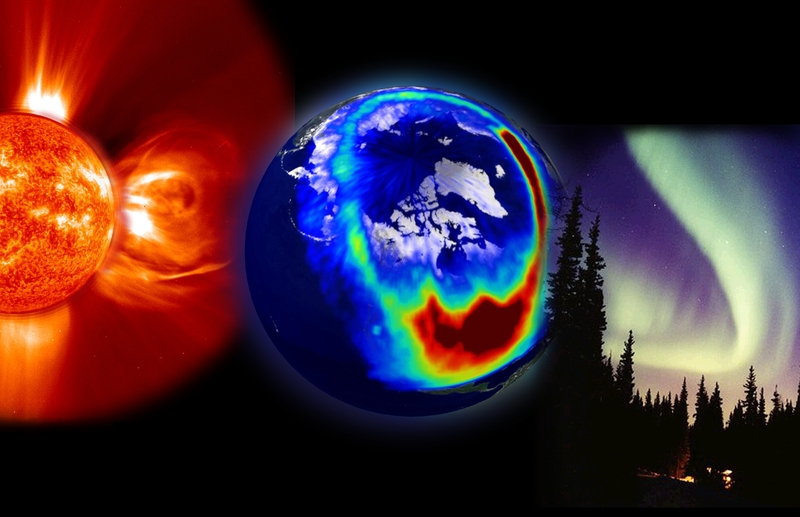 This composite image presents the three most visible elements of space weather: a storm from the Sun, aurora as seen from space, and aurora as seen from the Earth. The solar storm is a corona mass ejection (CME) composite from EIT 304Å superimposed on a LASCO C2 image, both from SOHO. The middle image from Polar’s VIS imager shows charged particles as they spread down across the U.S. during a large solar storm event on July 14, 2000. Lastly, Jan Curtis took this image of an aurora display in Alaska, the visible evidence of space weather that we see here on Earth.